If you believe your landlord is irresponsible, you need to ask a well-versed Ventura County personal injury attorney about the legal options available in your specific circumstances. Posted in personal injury attorney on Thursday, Aug 31, 2017. Summer wildfires are not over yet, at least not in California. The furious wildfires have caused much damaged in the sunny state. Hundreds of buildings in Northern California have destroyed thousands of homes. It’s not easy seeing your home burnt to the ground right before your very eyes. It’s even more difficult when landlords and insurance companies refuse to pay injured victims. In these scenarios is best contacting an experienced Ventura County personal injury attorney to find out how you can recover compensation for all your losses. Most burn injuries happen in places with landlords. Even when the fire occurred where you live, it may not be your fault. Landlords like to persuade tenants from pursuing legal action against them. It’s their responsibility to keep the property safe and in optimal conditions. They have to follow basic safety standards and the established codes. If a tenant is injured as a result of a landlord’s negligence, he or she is legally liable for the damages and injuries sustained in the accident. Landlords who own properties have to follow the law and keep their tenants safe. For example, if there is a broken staircase, slippery floors, the smoke detectors and fire extinguishers are damaged, tenants are more at risk of accidents, and burn injuries. Many apartment complexes in California are not following the procedures for fire safety. This is why it’s important you contact an Ventura County personal injury attorney if a fire breaks and you get injured. In some cases, the property owner may be held liable for your injuries. Fires can start anywhere but if the alarm is not installed in the right spot, the tenant is not warned about the dangers and may get injured as a result. Smoke alarms are one of the most essential aspects of fire safety. If you think your fire alarm has not been installed properly, make sure you speak to your landlord and request he or she corrects the situation. It’s best if a certified electrician installs them rather than a maintenance worker. They should have a battery backup and they should be hardwired. Some cheap smoke detectors cannot detect a lot of smoke while others are more efficient in every circumstance. They should be tested every month to ensure proper functioning. Fire extinguishers stop the fire from spreading. If there are no fire extinguishers in the property the Landlord will pay more for the damages caused to the tenant during the fire. It’s important you know where the fire extinguishers are located and make use of them in case of a fire. If you believe your landlord is irresponsible, you need to ask a well-versed Ventura County personal injury attorney about the legal options available in your specific circumstances. The landlord will try to pressure you and stop you from pursuing legal action against him or her. 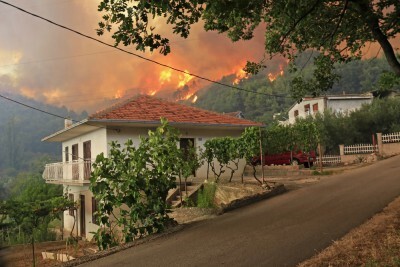 Wildfires in California are inevitable but you can do something to protect your family.